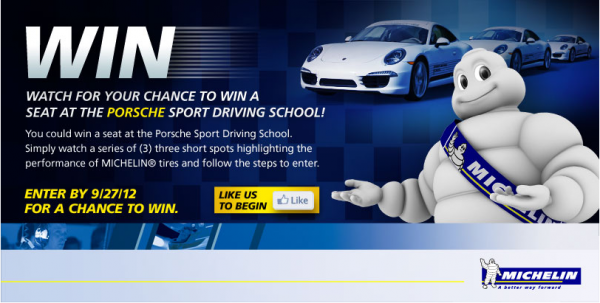 Want to win a trip to the Porsche Sport Driving School? How about one of three $475 credits toward your next set of Michelin tires? It's pretty easy to do. According to Michelin, they could tell you about their tires and key performances in categories like braking, handling and fuel economy. However, it's a lot easier to show you. That's exactly what they do with this contest. Simply follow this link and "like" Michelin on Facebook. Once you do that you'll be prompted to watch a set of three videos (they are super short and play one right after the other). Once you complete the three videos you'll be automatically forwarded to an entry form where Michelin asks you for some contact details. After you enter you'll be given a chance to "share" the contest with others for even more entries (up to 200 of them). The entry process is a bit long, but the second video in the series is pretty cool and we got a good laugh from the the third. Perhaps more importantly, they do provide good insight into why Michelin tires work so well (especially on our Porsches). The grand prize is a trip to the Porsche Sport Driving School that includes airfare, two nights hotel, ground transportation and a one-day "Precision" course at the school. Three alternative winners will receive a $475 gift certificate good toward their next purchase of Michelin Tires. Michelin Tire School. What Is It and Why Did We Go? The Rumors Are True! Grand-Am and ALMS Announce Formal Plans to Merge.